Golden & well rounded.What does it taste like? It's a tea with a lot of body and a light finish. Where does it come from? Our master blenders get to visit thousands of tea gardens to find the best teas for our English Breakfast Decaffeinated. We choose Kenyan teas for their bright amber colour and refreshing taste. It makes for a truly great cup of tea that you can enjoy all day long. What makes this tea different? 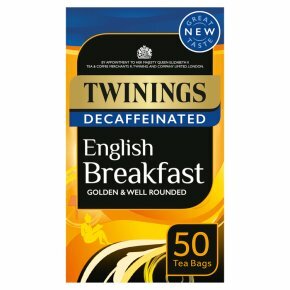 We blend the finest Kenyan teas in our English Breakfast Decaffeinated, for their rich and refreshing flavour.